Hi, this is Luis Villa, Thomas and Jesper’s former colleague at Capgemini Spain. 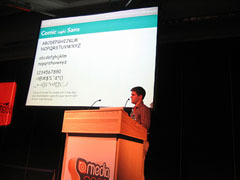 They couldn’t make it to @media in London last week, so they asked me to give a summary of the event. 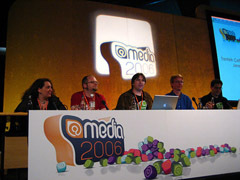 London @media 2006 was a Conference about frontend and web user interface in all its dimensions: strategy, design and building and after attending the W3C Technical Plenary at Cannes — more technical — it was the chance to see other people that have most influenced the user experience on the web and talking with them. Really, it felt like a rock concert full of fans. I’ll divide this post in two parts: first, I’ll start with my personal impressions and second, links to the presentations and materials (so you can jump to the bottom of the page). The web was born to help the community, and was evolved by the work and generous work of passionate experts as Eric Meyer pointed out on his keynote. Formal structures and big companies have proved to be inadequate to make the web evolve. I have learnt so much from the web design community so surely I have an obligation to give back to it. Listening to all the speakers, the web is about people and passion. 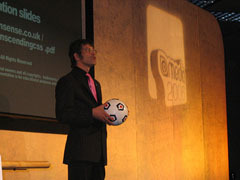 Passion and emotion were some of the most repeated words in all sessions. Never underestimate the effect of a small select group of passionate experts. On a more personal note I was left humbled by the passion of almost everybody I spoke with. While conferences like @media provide a focus for ideas, it’s in the day-to-day life of a designer or developer where the real hard work takes place. There seemed to be no lack of passion or excitement about design, standards or accessibility and still a great deal to talk about. “Do we need a formal structure, such as qualifications or a professional body, to identify the understanding of abilities of web designers?”. The panelists agreed on having a formal qualification could be, even, a drawback. Courses and certifications do not guarantee quality on web design because most of them are obsolete. Flow with the community as the way to learn and stay up to date. Usability, as the brand aesthetic Mr. Nielsen represents, sounds out of context in @media. The terms used to describe the interaction between users and website were more sophisticated: aesthetic, pleasure, quality, design, emotion, user experience, or even the more technical, accessibility. The term Usability, seem to be out of fashion among the twopointoh crowd. No speaker mentioned the term usability. 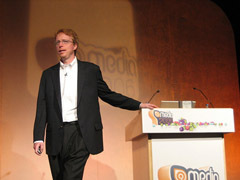 The closest one was Jeff Veen talking about ease of use as one of the important features of the so called Web 2.0. On web design issues, the community pay more attention to the Webstandards Group because of their sense of practice and empathy with the design and development professionals. 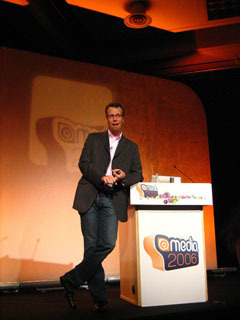 The fast growth of the microformats use, as a way of embedding semantics on the interface, is another example. Is W3C going out of the game? Web Content Accessibility Guidelines 2.0 (WCAG 2.0), have been criticized by web accessibility gurus as Joe Clark, members of the Webstandards Group, and designers and developers for being impractical and difficult to assimilate. Also, mentioning future W3C standards like CSS 3.0, SVG 2.0, XHMTL 2.0 or XForms as 2007 hot topics, made the audience break into laughs while community supported standards as microformats were applauded by the audience. Actual web design is based on old and boring patterns and standards that are proving not helping the user. 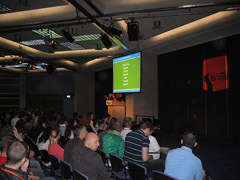 As Andy Clarke pointed out on his talk, a change of perspective is key to make a great web design. Actual web standards give lot of freedom to the designers and developers to make a whole new thing, escaping from that traditional software like interfaces, and getting to design usable, and also pleasurable and aesthetic products. Keep on evolving and growing the web takes so much effort. This could not be possible without passion and a sense of fun of the web design colleagues: Being sorroundend by porfessionals that enjoy playing, experiencing, learning and sharing their work will be key for the future of the user experience on the web. Luis Villa works in Spain at The Cocktail, User Experience Consulting Company, owner of La Coctelera, biggest blogging platform in spanish language and fully developed on Ruby On Rails. He’s one of the founders of alzado.org, and he’ll speak at Fundamentos Web 2006 International Conference. You can learn more about him in his personal blog grancomo.com (Spanish). This entry was posted by Luis Villa	on Sunday, June 25th, 2006 at 00:56 (GMT-1)	and is filed under Accessibility, AJAX, Events/seminars, User experience, User Interface, Web Development, Web Standards. You can follow any responses to this entry through the RSS 2.0 feed. Both comments and pings are currently closed. I disagree with London Sightseeing Tours, there is nothing easy about incorporating W3C standards. Small, medium and large sites with any slightly tedious functionality will struggle to made a site W3C compliant. We all see lots of sites that are XHTML, CSS compliant but very rare do you see others. I was impressed that Virgin Atlantics site is W3C compliant so it is possible. I think W3C is still important, but I doubt the Goog counts that as high as it once did, especially seeing as most major websites are not W3C compliant. I disagree with Andy Clark. Escaping from that traditional software like interfaces, doesn’t make design more usable.We all see lots of sites that are XHTML, CSS compliant but very rare do you see others. I was impressed that Virgin Atlantics site is W3C compliant so it is possible.